Android 4.4 (Kitkat) supported. 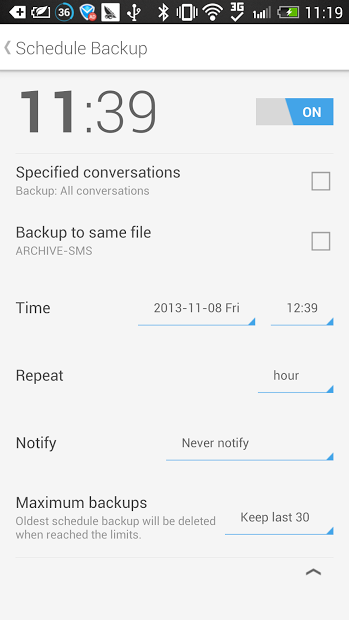 Best and Handy SMS backup & restore tool! Features:*Easy to use*Support Schedule Backup*Support restore, delete, export by conversation. *Support delete or clear stranger/old/all message. *1-click operation*Support export to web page format（HTML）*Fit f... see more Android 4.4 (Kitkat) supported. Click the &apos;Backup&apos;button of dashboard,input the backup file&apos;s name,press &apos;OK&apos; then backup will be started. Click the &apos;Restore&apos; button of dashboard,choose and click the backup file which you want restore from. 3. What is &apos;Clear SMS&apos;? corner,choose the &apos;feedback&apos; to send a email to us. Motorola, don&apos;t blame this app!